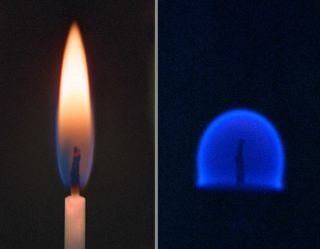 A candle flame in Earth's gravity (left) and microgravity (right) showing that difference in the processes of combustion in microgravity. When your homeis an aluminum spacecraft in Earth orbit- hundreds of miles from the nearest fire station - stifling a potential fireearly and fast can be a lifesaver. A team of scientists,engineers and astronauts areworking to do just that by building better detectors to pick up even thefaintest wisps of smoke before a blaze erupts inside a spacecraft. "You can'toperate a spacecraft with humans in it without having flammable materialsaround," David Urban, a researcher at NASA's Glenn Research Center who is working on the new detectors, told SPACE.com. "It's an ongoing risk that we're always worried about." That riskcrystallized last month during a brief scare aboard the International SpaceStation, when its Expedition13 crew reported a smoke-likesmell inside the laboratory's Russian segment. The odorprompted ISS flight controllers to declare a rare spacecraft emergency and wasultimately traced to the leak of amild toxic liquid - not a serious fire like that which struck Russia's MirSpace Station in 1997. But the incident reinforced the value of robustdetection systems not just aboard the ISS, but on all future spacecraft. "Theproblem is, in all cases, they designed these [smoke] detectors just usingengineering judgment," Urban said. "[Our] goal is to provide real statistics toguide the design of future detectors for the next vehicles." Smokebehaves differently in space than it does on Earth. In the absence of gravity, individualsmoke particles remain nearer to their source longer than their Earthcounterparts and ultimately clump together to form clusters that can be 10times bigger than terrestrial smoke particles, researchers said. "This isimportant because if you're building a smoke detector, you should know whatsize of smoke to look for," Urban said. During hissix-month tour aboard the ISS, Expedition 13 flight engineer JeffreyWilliams worked with Urban and his team on the Dust and Aerosol measurementFeasibility Test (DAFT) to test handheld smoke detection devices for futureorbital smoke experiments. Theexperiment revolved around a handheld device dubbed P-Trak - an off-the-shelfair quality tool modified by NASA engineers for use in microgravity - whichuses an internal laser and optical sensor to detect aerosols and smokeparticles. Williamscombined P-Trak with a modified home ionization smoke detector, a companiondust sensor - aptly named Dust-Trak - and a four-gallon (15-liter) bag.The astronaut then shot bursts of grade-A Arizona road dust, and used thedetection tools to measure the amount of material in the bag. "We'repretty happy with the runs we got in August," Urban said, adding that earliertests by ISS Expedition10 commander LeroyChiao successfully sampled the station's interior atmosphere. "So now we have an idea of what thespace station dust environment is." The spacestation's atmosphere, it turns out, is relatively dust free. That's a goodthing since the presence of dust can set off the orbital laboratory'slight-scattering smoke detectors in false alarms. Finessing future spacecraftdetectors to be sensitive enough to catch fires and smoke early - but not tothe point that false alarms become common - will be a challenge. "That's abig concern," Urban said. "The more false alarms you get the less respect yourdevice gets both by the crew and the ground operations people." There aretwo primary smoke detectors inside the space station's U.S.-builtDestiny laboratory, though similar sensors also safeguard the Russiansegments, researchers said. Smoke detectors are also installed in eachlaboratory rack that receives ventilation and power, they added. The stationis also equipped with carbon dioxide-based fire extinguishers in the U.S. segments and a water-foam system in the Russian modules. "Neitherhas ever been used in the space station," Urban said. The successof DAFT - all six hours of its operations - clears the way for an upcomingexperiment in which ISS astronauts will purposely start fires in space. Dubbed theSmoke and Aerosol Measurement Experiment (SAME), the tests call for short controlledfires to burn Teflon, Kapton tape, silicone, rubber and other spacecraftmaterials and then measure their resulting smoke with a P-Trak detector. "Thepurpose of SAME is to gather the data that we need to determine particle sizedistribution for these various smokes," said William Sheredy, NASA's SAMEproject manager at Glenn, in a telephone interview. SAME isslated to launch toward the ISS aboard a NASA shuttle in June 2007. Astronautswill install the smoke-detecting sensors and other equipment inside thestation's microgravity science glove box, and then ignite the tiny orbitalfires. A shuttle smoke detector will also be included to measure itsperformance, researchers said. Unlike thehandheld DAFT experiment, which relied on astronaut input via a keypad, SAME isdesigned to function autonomously during testing runs. "As we goto more autonomous systems we need to have a more autonomous fire detectionsystem," Urban said.